PCA Skin Intensive Clarity treatment, The ultimate retinol nighttime treatment for those prone to acne breakouts.Clear acne breakouts with 2% salicylic acid. The ultimate retinol nighttime treatment for those prone to acne breakouts. Find out more about our R-OH Retinol Solutions. In the evening only, apply a pea-sized amount after cleansing. Use twice per week, gradually increasing application frequency to every other night, and then advancing to each evening or as tolerated. Follow with the appropriate moisturizer. 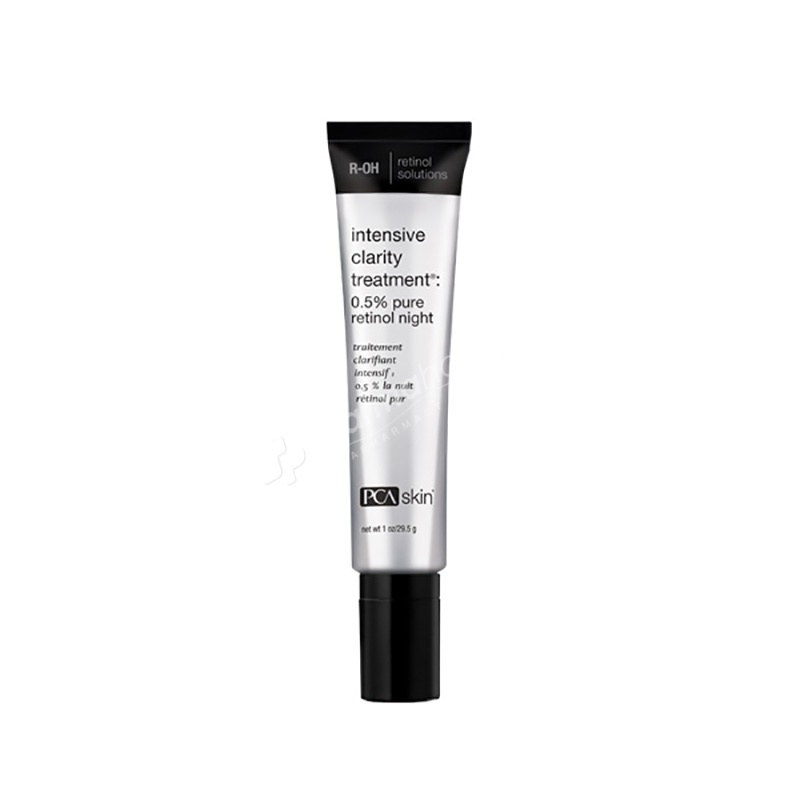 Note: It is important to wear a broad spectrum SPF during the day when using this product at night, since retinol is sun sensitizing. Water/Aqua/Eau, Hamamelis Virginiana (Witch Hazel) Water, Hydroxyethyl Acrylate/Sodium Acryloyldimethyl Taurate Copolymer, SD Alcohol 40-B, Gluconolactone, Retinol, Allyl Methacrylates Crosspolymer, Polysorbate 20, Caprylic/Capric Triglyceride, Ascorbic Acid, Dipotassium Glycyrrhizinate, Phytic Acid, Lactic Acid, Sodium Benzoate, Arginine, Glycerin, Vigna Aconitifolia Seed Extract, Sodium Citrate, Phenylethyl Resorcinol, Maltodextrin, Syringa Vulgaris (Lilac) Leaf Cell Culture Extract, Bakuchiol.